On a bright and warm beach, kissed the blue sea in the heart of the Gargano National Park, you will find the Camping “Fontana delle Rose” named after an ancient natural spring that flows from the nearby white cliffs. The weather is always cool and dry thanks to a pleasant breeze coming from the nearby mountains and the shade of the olive trees. Genuine hospitality, typical of the place and the inhabitants of the Gargano, and original flavors of a cuisine and typical of noble birth who handed down the ancient wisdom of using the land and the sea to draw nourishment, will make your holiday unforgettable in the CAMPING “Fontana Delle Rose” making them forget the stress of work and the chaos of the city. It is possible to choose among the spacious camping pitches (in tents, caravans or campers), the Coco Sweet (equipped and furnished tents … also called GLAMPING) or the comfortable mobile homes (bungalows) with air conditioning … for those who do not love give up comfort. PS: The Camping is directly on the sea … access to the beach with a comfortable staircase of 80 steps. The camping holiday has always been one of the best forms of sustainable, low-impact vacation, a responsible holiday that respects the environment and the territory. 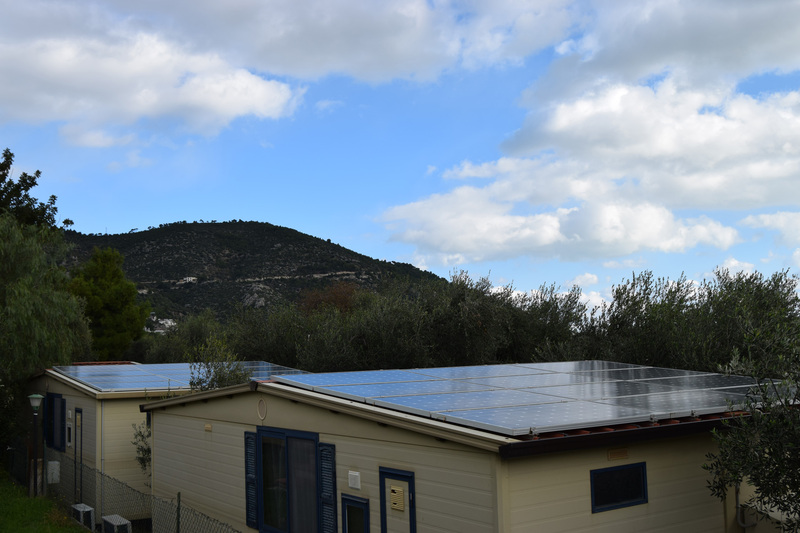 Nel 2012, con la costruzione di un impanto fotovoltaico, il Camping Fontana delle Rose diventa il primo camping del Gargano ad essere “praticamente” ad impatto zero. The system consists of more than 300 modules distributed on the Prefabricated Houses, together with the use of LED bulbs and / or low energy consumption and air conditioners with heat pump (class A and A +), allows to meet almost the entire electricity demand of the structure with energy from renewable sources, thus avoiding the emission into the atmosphere of over 35 tons of CO2 a year! While everyone is talking about anti-SMOG measures to reduce CO2 and greenhouse gas emissions … WE DO OUR PART. If you add to this the fact that, once at the campsite, you will NOT even need to use your vs. car (except for visiting the rest of the Gargano), you will get an ECO-sustainable and ECOlogic holiday!